In New York, an angry and violent Mohammed Husain (Bhanu Uday) arrives imprisoned by his past. His mission is to kidnap and kill a peaceful Muslim scholar, Fareed Rahmani (Victor Banerjee). On the other side of the world in New Delhi, Leela Singh (Preeti Gupta) is a homosexual girl who kidnaps her bisexual lover, Sakhi (Bhavani Lee), intending to marry her and live happily ever after. These are four characters in two of the largest cities in the world all coming face-to-face with brutal acts of torture and violence. It is the choices they make when they are cornered that exposes their own blemished realities. 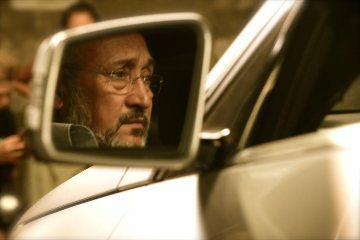 Blemished Light is a thought-provoking and meaningful film with director Raj Amit Kumar doing a stellar job of creating an atmosphere that is authentic, intimate, tense, and never less than compelling. The film benefits greatly from stellar technical credits from Academy Award-winning sound designer Resul Pookutty and Hari Nair's stellar lensing. Victor Banerjee, perhaps best known to American audiences for A Passage to India, gives a steady and disciplined performance as Rahmani, while Bhanu Uday (Monsoon) adds an unforgettable spark. There is, as one might expect, an intimacy and emotional resonance within the coupling of Leela and Sakhi, though it is done in a way that respects the layers upon layers of other issues that accompany everything that is going on. Both Preeti Gupta and Bhavani Lee are excellent. Blemished Light had its official premiere on December 10, 2014, also known as Human Rights Day, and has already screened at the Kerala International Film Festival, Portland Film Festival, Indie Gems Film Festival, and the Chelsea Film Festival. With its universal themes and willingness to cross cultures, Blemished Light should have no problem finding a long life on the fest circuit on both the indie scene and, if it chooses, the LGBT scene.